Time and time again we have to help clients with optimising blog posts. A lot of the time companies do not see the importance of the blog pieces and are just seen as nice to have. In the world of SEO we hear time and time again that content is king, but what the don't tell is that layout is queen as is the beauty that captivates the readers and keeps them staying a little bit longer. Even though layout needs to be considered when writing the piece, a great layout does not make up for mediocre content. It may keep readers attention for longer but nothing can replace poorly written content. The layout is merely the aesthetics that adds that little something to your piece. If you struggling with coming up with great ideas for content pieces, try using one of these nifty blog topic generators It's always good to ask yourself the following questions when reviewing your post. Does it promote scanability and easy for users to pick up the essence of the piece without having to read anything? Is the language I am using tailored to my audience? Am i adding value with this post? If your answer is no to any of the above, here's how to fix it! For the sake of simplicity, we will use the following model as a reference to break down the core structural elements of a perfectly optimised blog post. More on creating killer headlines here. 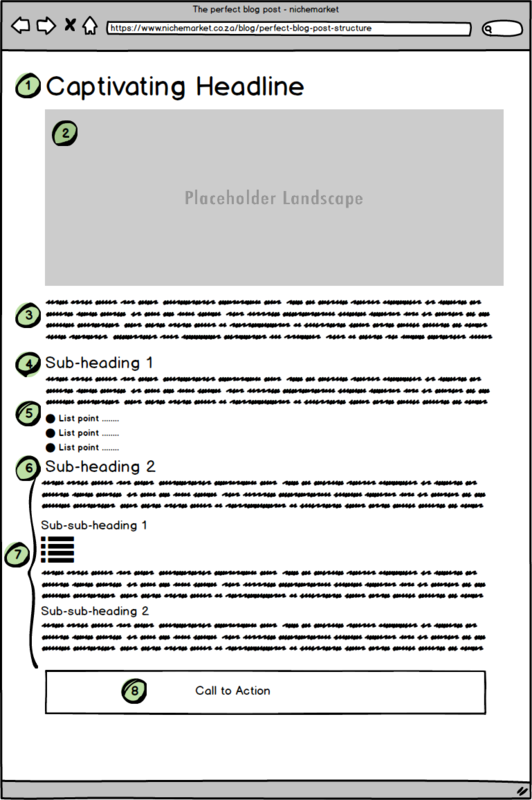 Choose a related but hot placeholder image that is alluring and will attract users. This will most likely be the first visual element they will see both on your landing page and on all social platforms. The point of your intro text is to get users to read your opening. If they read the entire intro, they will most likely read the entire article. You have 3 to 4 sentences to work with here, make it count! This subheading has one purpose and one purpose only, i.e. to get used to reading the first piece of content. Set the Tone by asking a question or introducing the focus topic. Keep it relevant and captivating. Your first piece of body content should try and trigger some sort of emotion in a user, help them relate and make them connect with the piece. If you set off this trigger they are more likely tp take action. Make this easy to ready, use paragraphs to separate ideas and bullets and lists if items are fitting. Set the tone for the next content piece by bringing out its key focus. This is the part of the article where people learn something or discover what they needed to, this is the whole point of why the article came about. This portion is the bulk of your body content. The essence of your article will be presented here and this is where readers will learn and discover step by step process or the answer to the question you posed in your heading. Break this section into subheadings if it's easier to read, or use bullets and list where appropriate. This may be the end of the blog post, but it might just be the start of your relationship with your customer. You captivated them, you gave them some knowledge, now you asking for a little something-something in return. You have two lines to sum things up and hit those readers with a call to action. If you really want them to take action, add a link or two so they have something concrete to follow up on. And that's what it takes to write a killer blog post and laid out to perfection. If your posts aren't doing what they should try improving the layout and see how they perform. If you looking for a real live sample, you reading it. Have a look at our other blog posts for more examples. If you have any questions or would like to know more about optimising blog posts, comment below or feel free to contact us here!